In a special edition of TEDWeekends, TED and The Huffington Post are partnering to co-premiere a talk by this year's TED Prize winner. The TEDTalk by the winner is accompanied by an original blog post, along with new op-eds, thoughts and responses from the HuffPost and TED communities. Watch the talk above, read the blog post and tell us your thoughts below. Become part of the conversation! From Plato to Aurobindo, from Vygotsky to Montessori, centuries of educational thinking have vigorously debated a central pedagogical question: How do we spark creativity, curiosity, and wonder in children? But those who philosophized pre-Google were prevented from wondering just how the Internet might influence the contemporary answer to this age-old question. Today, we can and must; a generation that has not known a world without vast global and online connectivity demands it of us. But first, a bit of history: to keep the world's military-industrial machine running at the zenith of the British Empire, Victorians assembled an education system to mass-produce workers with identical skills. Plucked from the classroom and plugged instantly into the system, citizens were churned through an educational factory engineered for maximum productivity. But what got us here, won't get us there. Schools today are the product of an expired age; standardized curricula, outdated pedagogy, and cookie cutter assessments are relics of an earlier time. Schools still operate as if all knowledge is contained in books, and as if the salient points in books must be stored in each human brain -- to be used when needed. The political and financial powers controlling schools decide what these salient points are. Schools ensure their storage and retrieval. Students are rewarded for memorization, not imagination or resourcefulness. Today we're seeing institutions -- banking, the stock exchange, entertainment, newspapers, even health care -- capture and share knowledge through strings of zeros and ones inside the evolving Internet... "the cloud." While some fields are already far advanced in understanding how the Internet age is transforming their structure and substance, we're just beginning to understand the breadth and depth of its implications on the future of education. Unlocking the power of new technologies for self-guided education is one of the 21st century superhighways that need to be paved. Profound changes to how children access vast information is yielding new forms of peer-to-peer and individual-guided learning. The cloud is already omnipresent and indestructible, democratizing and ever changing; now we need to use it to spark the imaginations and build the mental muscles of children worldwide. 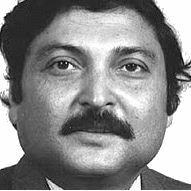 This journey, for me, began back in 1999, when I conducted an experiment called the "hole in the wall." By installing Internet-equipped computers in poor Indian villages and then watching how children interacted with them, unmediated, I first glimpsed the power of the cloud. Groups of street children learned to use computers and the Internet by themselves, with little or no knowledge of English and never having seen a computer before. Then they started instinctually teaching one another. In the next five years, through many experiments, I learned just how powerful adults can be when they give small groups of children the tools and the agency to guide their own learning and then get out of the way. It's not just poor kids that can benefit from access to the Internet and the space and time to wonder and wander. Today, teachers around the world are using what I call "SOLEs," "self organized learning environments," where children group around Internet-equipped computers to discuss big questions. The teacher merges into the background and observe as learning happens. I once asked a group of 10-year-olds in the little town of Villa Mercedes in Argentina: Why do we have five fingers and toes on each limb? What's so special about five? Their answer may surprise you. The children arrived at their answer by investigating both theology and evolution, discovering the five bones holding the web on the first amphibians' fins, and studying geometry. Their investigation resulted in this final answer: The strongest web that can be stretched the widest must have five supports. Today, I launch my SOLE toolkit -- designed to empower teacher and parents to create their own spaces for sparking children's curiosity and agency. My team and I are excited to see more educators trying this future-oriented pedagogical tool on for size and then sharing their learnings are insights so we can all benefit from the hive mind. Meanwhile, with my newly bestowed TED Prize, my team and I will build The School in the Cloud, a learning lab in India where children can embark on intellectual adventures by engaging and connecting with information and mentoring online. Technology, architecture, creative, and educational partners will help us design and build it. Kids will help us explore a range of cloud-based, scalable approaches to self-directed learning. A global network of educators and retired teachers will support and engage the children through the web. We need a curriculum of big questions, examinations where children can talk, share and use the Internet, and new, peer assessment systems. We need children from a range of economic and geographic backgrounds and an army of visionary educators. We need a pedagogy free from fear and focused on the magic of children's innate quest for information and understanding. In the networked age, we need schools, not structured like factories, but like clouds. Join us up there. 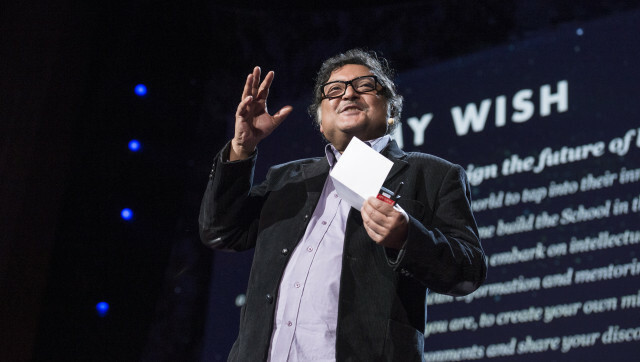 Watch Sugata Mitra's interview with HuffPost Live here. This story appears in Issue 39 of our weekly iPad magazine, Huffington, in the iTunes App store, available Friday, March 8.